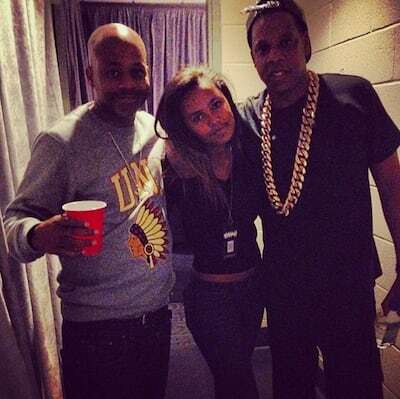 Back in August, Dame Dash and Jay Z reconnected at a birthday party for Def Jam&apos;s Chaka Pilgrim at the King and Grove Hotel in Brooklyn. While that reunion was almost seven years in the making, it took only four months for the original Roc Boys to link up again. Today, Dash has Instagrammed a smiley group of photo of him, Ava Dash, and Jay backstage at the Staples Center, the host of last night&apos;s stop on the Magna Carta Holy Grail tour. Below, you can see an equally cheerful pic of Ava posing with Jay. Could a real Roc reunion be in the works? RELATED: What Were Jay Z and Dame Dash Really Talking About Last Night?